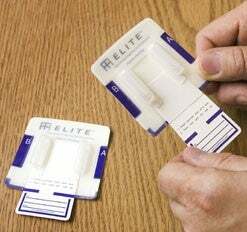 Now you could argue that a minute is one minute too slow, but for those times when the bomb squad ain't around, the pocket-friendly ELITE (Easy Livermore Inspection Test for Explosives) detector lets you sniff out up to 30 different types of explosives. Just rub one of the ELITE swipes on the suspicious package (hopefully you won't set it off while doing this) and wait a minute for the color-coded results (just like a pregnancy test!). The kit will only set you back $10.